The Laureus World Sports Award for Team of the Year is an award honouring the achievements of those teams who have demonstrated "supreme performance" in the world of sports. It was first awarded in 2000 as one of the seven constituent awards presented during the Laureus World Sports Awards. The awards are presented by the Laureus Sport for Good Foundation, a global organisation involved in more than 150 charity projects supporting 500,000 young people. The first ceremony was held on 25 May 2000 in Monte Carlo, at which Nelson Mandela gave the keynote speech. As of 2017[update], a shortlist of six nominees for the award comes from a panel composed of the "world's leading sports editors, writers and broadcasters". The Laureus World Sports Academy then selects the winner who is presented with a Laureus statuette, created by Cartier, at an annual awards ceremony held in various locations around the world. The awards are considered highly prestigious and are frequently referred to as the sporting equivalent of "Oscars". "team that best demonstrates supreme performance and achievements – such as world, continental, international or national and major championship titles"
The inaugural winner of the award was English football team Manchester United, who had completed an "historic treble" by winning the UEFA Champions League, the Premier League and the FA Cup during the 1998–99 season. Football teams, including both domestic and international sides, have won more awards than any other sport with ten, followed by rugby union and Formula One teams (three). Teams from Germany and France have won the award three times, while teams from England and Spain and have won it twice. The 2019 winner of the Laureus World Sports Award for Team of the Year was the France national football team. Manchester United won three trophies in the 1998–99 season and won the inaugural Laureus team award in 2000. 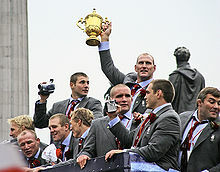 England's rugby union team won the World Cup in 2003, and won the Laureus team award the following year. 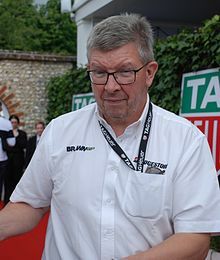 Ross Brawn's Formula One team Brawn GP won the award in 2010. The Chicago Cubs celebrating winning the 2016 World Series – they were the 2017 recipients of the Laureus team award. ^ Church, Ben (19 February 2019). "Lindsey Vonn wins Spirit of Sport award at the 'Oscars of Sport'". CNN. Retrieved 21 February 2019. ^ a b Wright, Nicholas (27 February 2018). "Roger Federer wins Sportsman and Comeback of the Year at Laureus Awards". Sky Sports. Archived from the original on 28 February 2018. Retrieved 28 February 2018. ^ Sugden, John; Tomlinson, Alan (30 April 2017). Sport and Peace-Building in Divided Societies: Playing with Enemies. Taylor & Francis. p. 163. ISBN 1-136-29233-0. Archived from the original on 18 October 2017. ^ "Man Utd as good as 1999 Treble-winning team – Beckham". BBC Sport. 16 February 2010. Retrieved 24 October 2017. ^ "Sir Alex Ferguson Retires: SAF's Best Manchester United Moments in Pictures". International Business Times. 8 May 2013. Archived from the original on 1 December 2017. Retrieved 30 November 2017. ^ a b "Sports Awards: England's World Cup winners Team of the Year". The Independent. 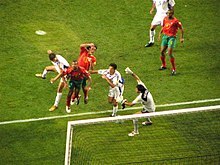 10 May 2004. Archived from the original on 24 October 2017. Retrieved 24 October 2017. ^ a b "Federer is Laureus sportsman of the year". The Hindu. 18 May 2005. Archived from the original on 24 October 2017. Retrieved 24 October 2017. ^ a b "Laureus World Team of the Year 2010 nominees". Laureus. Retrieved 24 October 2017. ^ a b "Novak Djokovic wins Laureus for sportsman of the year". ESPN. Associated Press. 15 April 2015. Archived from the original on 19 October 2017. Retrieved 19 October 2017. ^ a b "Laureus Awards 2017: Bolt, Biles, Rosberg, Atherton & Leicester among winners". BBC Sport. 14 February 2017. Archived from the original on 8 June 2017. Retrieved 18 October 2017. ^ "Laureus World Team of the Year 2000 nominees". Laureus. Retrieved 24 October 2017. ^ a b Segura, Anna (7 February 2012). "Laureus Award tops off a year of recognition". FC Barcelona. Archived from the original on 24 October 2017. Retrieved 24 October 2017. ^ "Laureus World Team of the Year 2001 nominees". Laureus. Archived from the original on 24 October 2017. Retrieved 24 October 2017. ^ "World Cup heroes honoured". BBC Sport. 10 May 2004. Retrieved 24 October 2017. ^ "Laureus World Team of the Year 2002 nominees". Laureus. Archived from the original on 24 October 2017. Retrieved 24 October 2017. ^ Mulvey, Paul (14 May 2002). "Waugh's men world team of the year". ESPNcricinfo. Archived from the original on 13 April 2014. Retrieved 23 October 2017. ^ "Armstrong, Serena adjudged best at Laureus awards". The Hindu. Reuters. 22 May 2003. Archived from the original on 25 September 2003. Retrieved 24 October 2017. ^ "Laureus World Team of the Year 2004 nominees". Laureus. Archived from the original on 24 October 2017. Retrieved 24 October 2017. ^ "Laureus World Team of the Year 2005 nominees". Laureus. Archived from the original on 24 October 2017. Retrieved 24 October 2017. ^ "Laureus World Team of the Year 2006 nominees". Laureus. Retrieved 24 October 2017. ^ "Federer, Kostelic given top awards". CNN. 22 May 2006. Archived from the original on 15 April 2015. Retrieved 19 October 2017. ^ "Laureus World Team of the Year 2007 nominees". Laureus. Archived from the original on 24 October 2017. Retrieved 24 October 2017. ^ "Laureus World Team of the Year 2008 nominees". Laureus. Retrieved 24 October 2017. ^ "British pair scoop Laureus awards". BBC Sport. 18 February 2008. Archived from the original on 25 February 2008. Retrieved 18 October 2017. ^ "Laureus World Team of the Year 2009 nominees". Laureus. Retrieved 24 October 2017. ^ "China team gets sports award". United States Olympic Committee. Associated Press. 26 June 2009. Retrieved 24 October 2017. ^ "Usain Bolt, Serena Williams win Laureus Awards". San Diego Union Tribune. Associated Press. 10 March 2010. Archived from the original on 19 October 2017. Retrieved 19 October 2017. ^ "Laureus World Team of the Year 2011 nominees". Laureus. Retrieved 24 October 2017. ^ "Laureus World Team of the Year 2012 nominees". Laureus. Retrieved 24 October 2017. ^ "Laureus World Team of the Year 2013 nominees". Laureus. Retrieved 24 October 2017. ^ Fonseca, Pedro (12 March 2013). "Bolt, Ennis win top Laureus awards". Reuters. Archived from the original on 21 October 2017. Retrieved 18 October 2017. ^ "Laureus World Team of the Year 2014 nominees". Laureus. Retrieved 24 October 2017. ^ "Sebastian Vettel and Missy Franklin win Laureus world awards". BBC Sport. 26 March 2014. Archived from the original on 21 October 2017. Retrieved 19 October 2017. ^ "Laureus World Team of the Year 2015 nominees". Laureus. Retrieved 24 October 2017. ^ "Laureus World Team of the Year 2016 nominees". Laureus. Retrieved 24 October 2017. ^ "2019 nominees list revealed". Laureus. 17 January 2019. Retrieved 21 February 2019.